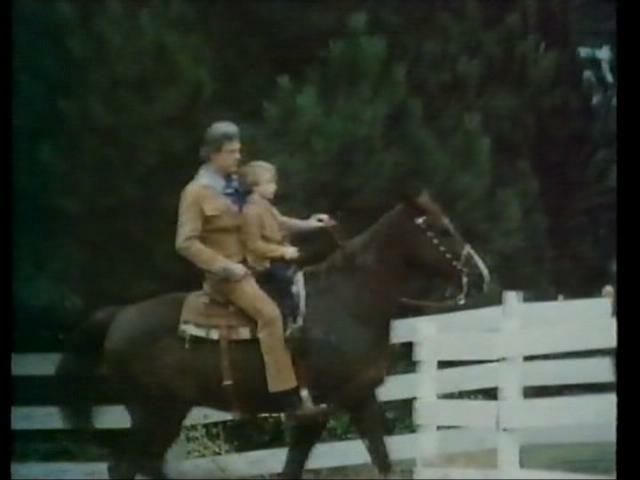 Back in 2008, when I found the I Spy episodes, Greatest American Hero video, the Get Smartclip and a couple other gems on YouTube, I found a “trailer” of sorts for this 1973 made-for-tv movie. 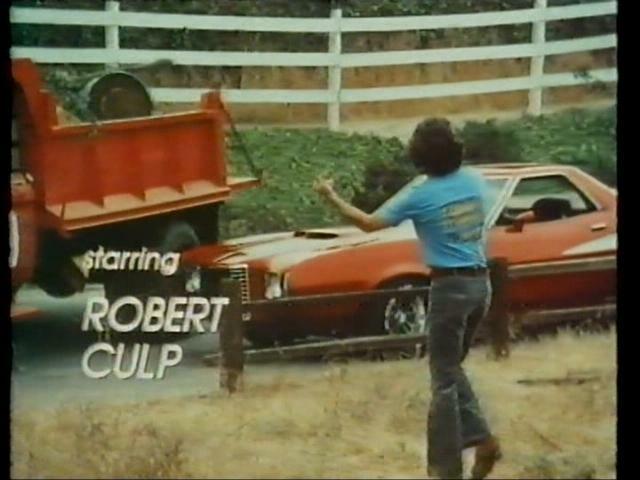 The video has since been removed from YouTube, but it was a collection of scenes from the movie, including parts of the ending where Culp goes “calmly ballistic” and smashes the hell out of whatever he can with his pickup truck and baseball bat. After seeing the clip and reading a little bit more about the movie, I knew I had to find it just so I could watch him go berserk and cheer him on. I love old/classic cars but the kids in this film looked like a bunch of real pieces of —-. 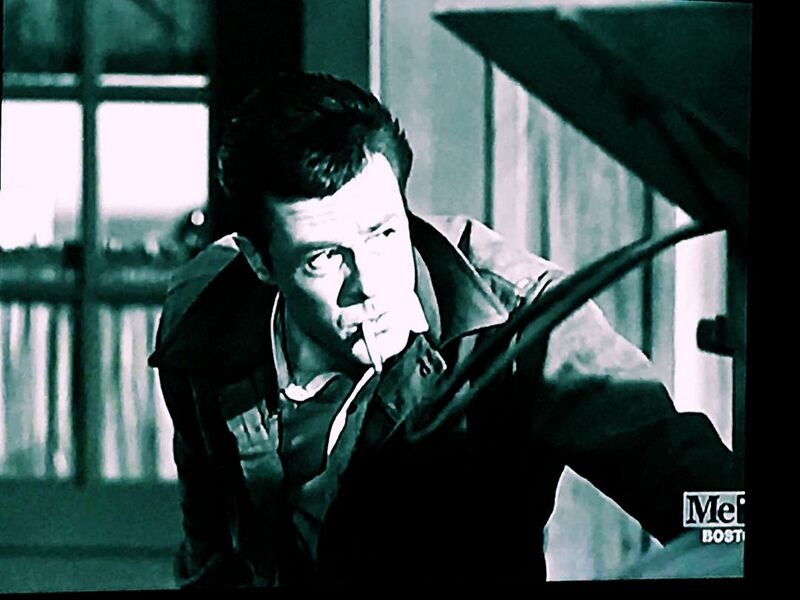 I eventually did find the film at a wonderful website called modcinema.com, which specializes in rare and hard to find 60s and 70s feature films and made-for-tv movies. The copy is good, but the viewer should be aware that it is not a remastered film. Capping this thing proved challenging and there were some shots I could not get that were very clear. The events in this movie were based on an actual incident that occurred. 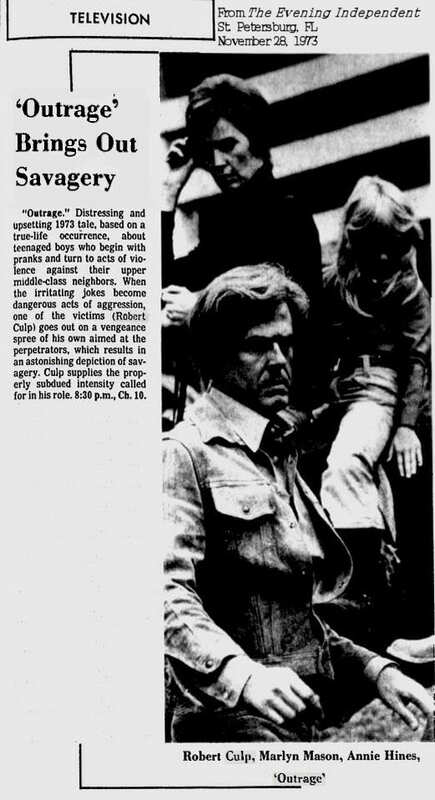 Culp plays Dr. Jim Kiler, a veterinarian, who lives with his wife and children in an affluent gated community called “Oak Meadows” in California. Unfortunately, some of the residents of the community include some spoiled and bored rich kids who have nothing better to do with their time than tear around in their hotrods harassing the neighborhood. The movie opens with the boys dumping a truck full of junk and garbage into the swimming pool of an older woman who lives in the neighborhood. When the kids’s drag racing spooks the horses Jim and his family are riding, Jim and his wife, Muriel (Marlyn Mason) decide to start a petition to install speed bumps and stop signs in the neighborhood. And things begin to escalate from there. 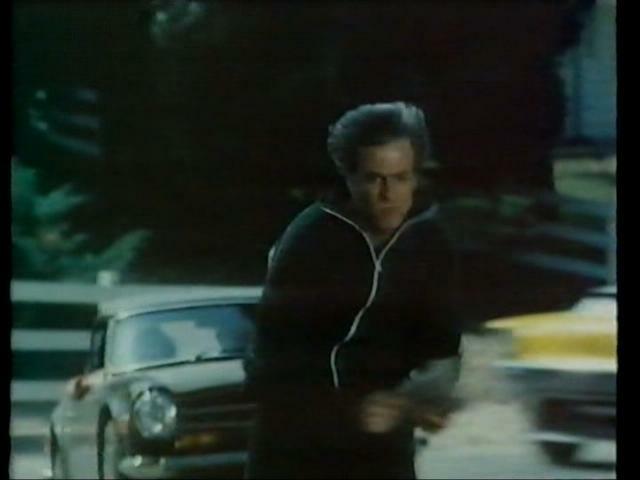 Vance Chandler (the leader of the pack, if you will – played by Tom Leopold) and another kid are racing up and down the street and nearly run Kiler down in his own driveway. 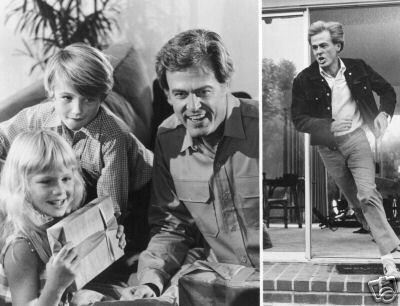 The other kid’s car suffers a broken headlight, and Jim ends up with a broken hand as he ends up karate chopping the thing. Jim gets nowhere with the Sheriff’s department or the highway patrol as he has only a vague description of the car and obviously couldn’t get a license plate while diving out of the way. He confronts Vance afterwards, wanting to know who the other boy was. He gets a name, and then gets some additional information from the police who track down the car. Jim then talks to the young man, Carl Dibble. Carl (played by Don Stark – whom I have an interesting tidbit about when I get to the end of this) seems to show some genuine remorse for what happened and doesn’t want for things to be escalated by any lawsuits or anything. Jim doesn’t say one way or the other if he’ll press charges. In the end, he does. In court, however, when Vance Chandler and Ron Werner’s parents don’t show up, the judge postpones the hearing to a later date, which only opens up a whole lot of time for Chandler and his friends to harass Jim and his family. And harass, they do. They start by throwing cans of paint at the house. Then the boys fire incendiary devices over the house and over the lawn, setting a hay bale on fire. The Kilers get no help from the law and already by this point Murielwants to move. Jim, however, refuses to cave in to a bunch of “spoiled brats.” In fact, he’s so adamant it’s the first real flash of red hot anger we see from him. For the rest of the movie, however, Kiler is a man who is constantly simmering and trying very hard to do things by the law. He calms himself immediately though and instead he suggests that Muriel not be at the house by herself and they ask their housekeeper, Thelma, to stay during the day. She does, and as expected, the torment from the boys continues. They dig up and tear apart the plants Muriel was planting, only to get a free bath from Thelma when she turns on the lawn sprinkler. Undeterred, the boys then plant a cherry bomb in the Kiler’s mailbox. Again, the law can’t do much. But the deputy offers to put in some off duty time to try to catch the boys. Although Jim appreciates the offer and agrees, it’s still unofficial. 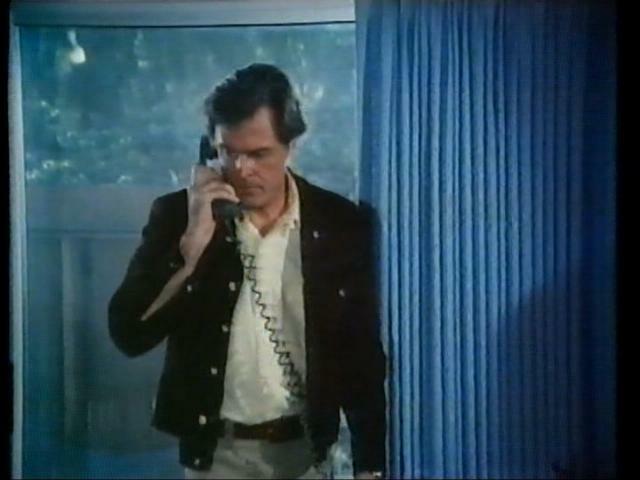 The antics continue with Vance making an obscene phone call and then taunting Jim after Kiler picks up the extension. Jim’s simmer starts to boil and he’s about to march out of the house to confront Vance again. Muriel tells Jim to stay put while she goes across the street to try to talk to Mr. Chandler, which gets her nowhere. Chandler tells her to tell Jim to leave his family alone. Thing is, Jim had followed Muriel over and hears this just in time. When Jim confronts Chandler, Chandler tries to take a swing at him only to end up on the ground by Jim. 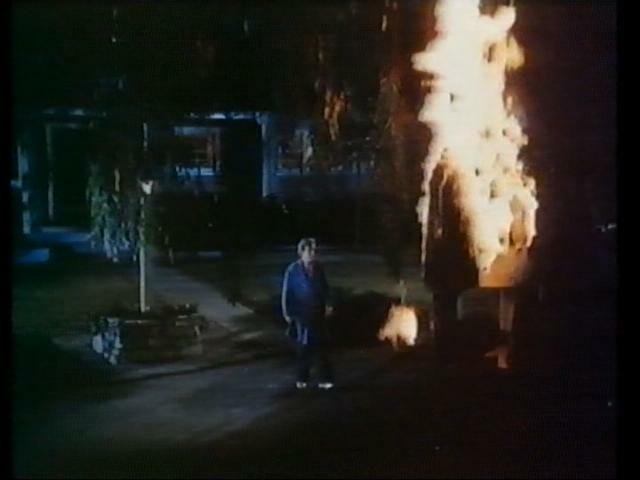 Muriel pulls Jim away and walks him back to the house. By this point, Muriel is at her wits end. She’s begun taking tranquilizers to get through the day. Jim tells her he wants her and the kids to go to her mother’s for a while, until the trial is over. She doesn’t want to go – she’d rather just pack up and move out of the neighborhood. 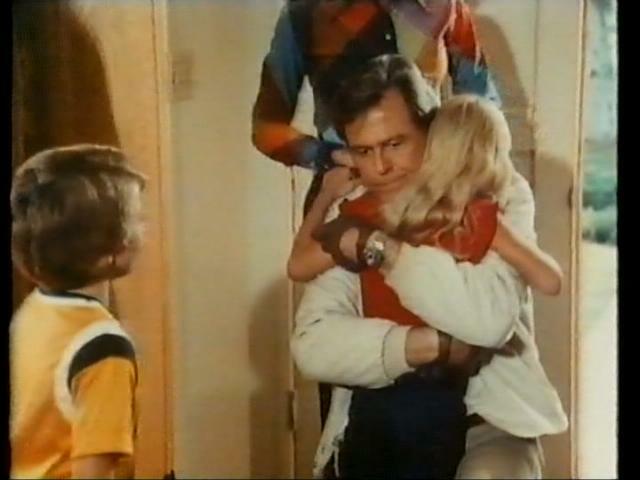 But Jim refuses to give in to the threats and antics of these kids and reminds her of that. While they’re talking, the boys have been busy stringing up an effigy outside the Kiler’s home. With the call of their car horns and revving engines, the Kiler’s come out side in time to see effigy’s of them, burning from the tree. The next day Jim sees his wife and kids off. Vance and his buddies are watching from across the street and they follow Muriel as she drives out of the neighborhood, tailgating, hollering and blaring horns. Jim follows in his truck. Chandler and his friends then let her go and double back to the Kiler home, proceeding to take the split rail fence down. 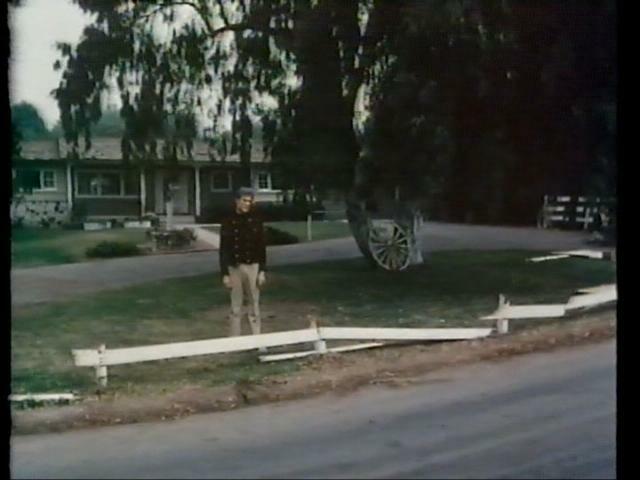 Jim returns home to find his fence destroyed. The deputy sheriff makes a stop by, unfortunately not soon enough to have caught the boys in the act. He then finds out that Jim has sent Muriel away and is disappointed, as he had asked that an adult be at the house at all times in order to try to catch these kids in the act. Of course, he then tells Jim that he would be away for a while as his son and daughter in law had just bought a new house up in Oregon. In court, Carl Dibble has changed his plea to no contest for the hit and run. As a result he is given one year probation, a $200 fine and his license is suspended for six months. 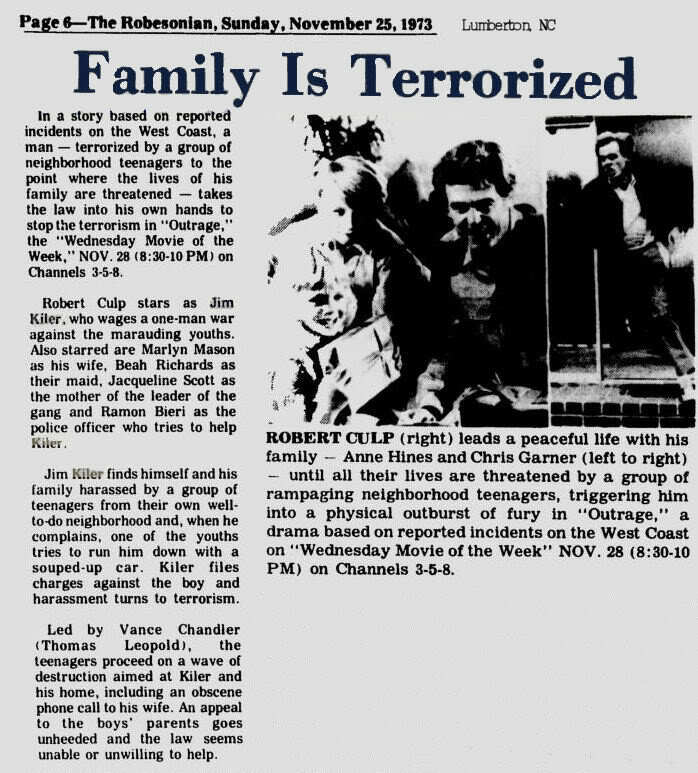 Unfortunately, as a result of Carl’s change of plea it lets Vance Chandler and Ronald Werner off the hook and the charges against them are dismissed, much to Jim Kiler’s surprise. The judge makes his displeasure clear and speaks strongly to the parents, telling them to straighten these boys up or else they could end up in prison someday. With the trial over, and the boys let off scot free, Jim’s not sure if they’ve sobered up a bit or if they’ll be encouraged to try more antics. He phones Muriel and tells her to wait a couple of days before coming back home. Jim attempts to get things back to some kind of normal and has some workers working on cleaning up the red paint from the face of the house. But the antics of the boys continue. After returning from a horse ride, Jim heads out behind the house to put the horse in the stall. The family dog, Oliver, remains out front, where he’s spotted by the boys as they drive by. They entice the dog with some food and essentially dognap him. It doesn’t seem like the boys intended for any harm to come to the dog, but as they’re playing with Oliver, Vance comes barreling through in his car – and hits the dog. They leave Oliver on Kiler’s front step to be found later that night. Jim makes an appearance at the next town meeting to talk about the teenage violence. He had distributed a letter and got responses back from other teens in the community who had no qualms about naming names as to who were responsible for the acts of violence that were taking place. Jim names the families, getting as far as the Chandlers and the Werners. Mr. Werner objects, threatening to sue for slander. But then another citizen comes to the defense of Jim and when Jim delivers a speechify about controlling the kids to prevent someone from getting hurt, or killed, the townsfolk applaud. Jim proceeds, at the behest of the Mayor, to name the names. 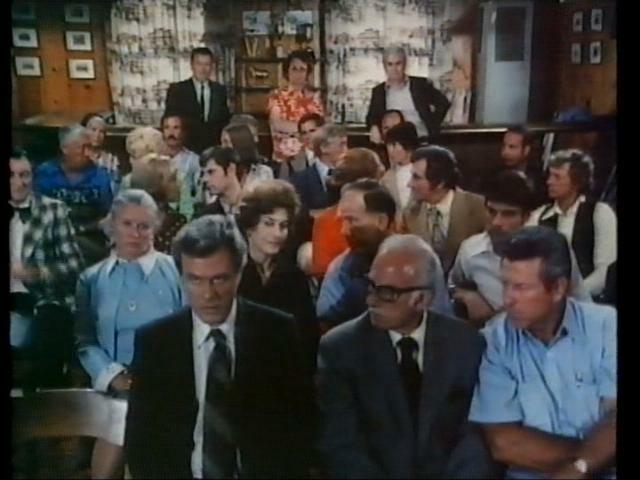 The families accused walk out, but the rest of the townsfolk still back up Jim. Despite the support, the town folk vote against any new spending on additional protection from the Sheriff’s department. For three weeks though, things seem quiet. Muriel returns home with the kids and, other than having to explain about the loss of Oliver, it seems like things can finally get back to normal. The young girl’s birthday is coming up and since Thelma will miss the actual day, they decide to have a little get up that night with some cake and ice cream. Chandler and his friends decide to put some “icing on the cake” and they lob bricks through the kitchen window, injuring Thelma. This becomes the incident that finally sends Jim over the edge. He heads out with his pickup truck and baseball bat and proceeds to smash the hell out of each of the cars involved, along with some fences and a greenhouse. At each stop, he announces himself. He pours paint over one of the cars. Tosses patio furniture through a front window. Breaks a window at another house and shoves the garden hose through, spraying water at full blast. And he smashes out the windows on all the cars. At the Chandler house, he pushes Vance’s Chevy with his truck. He then breaks the windows on the car, all the while calling for Chandler, who looks out from within the house. For Chandler, however, Jim has reserved a very special revenge. He pushes Vance’s car down to the bottom of the drive way, stuffs paper into the gas tank and lights it on fire. 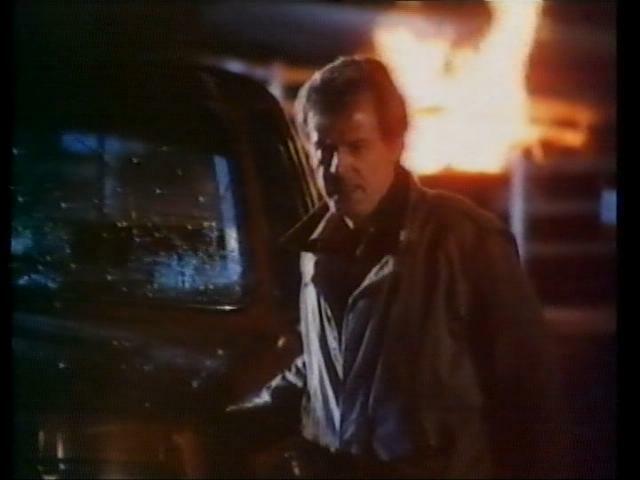 He jumps back in his truck, zips across the street and gets back out in time to turn around and watch Vance’s Chevy blow up into a huge fireball. He tries so hard to do things legal and civil like. 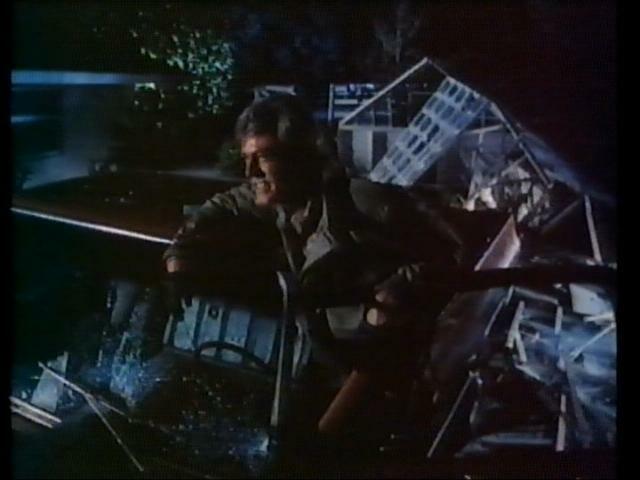 Throughout the movie the antics of the boys involves mostly just property damage. With the death of Oliver one might have thought that would have sent Jim over the edge. He’s clearly heartbroken and at that point pleads to the entire town for some kind of help. But even then, he doesn’t get any. The final straw comes during a special moment for one of his kids. A simple little birthday celebration, being held special so that Thelma can be there, is shattered, literally, by Vance and his friends and Thelma is injured. It could have just as easily been Muriel or one of the kids who got struck by the brick. 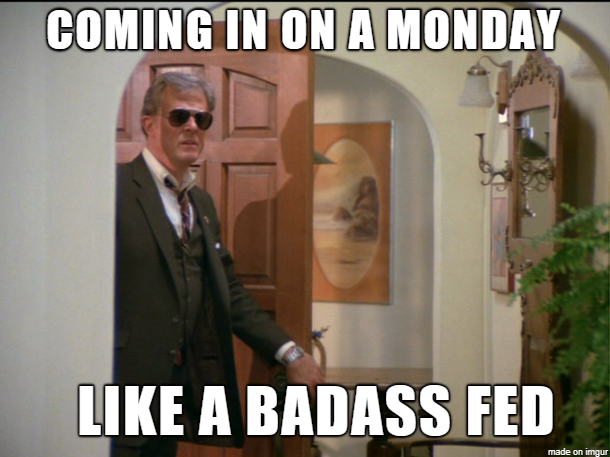 And you know Culp, as Kiler, knows this. The look on his face, after the ambulance pulls away from the house, goes from exhaustion and defeat to the dangerous look of complete and total…outrage. He’s crossed the line and there’s no turning back. Not even Muriel’s plea, her reminder of his promise of no violence, does any good. He’s too far gone. Only he’s not playing. Maybe the final destruction sequence is tame compared to anything nowadays, but don’t look at just what he does physically. Watch his expression. For crying out loud, if it weren’t for the fact that he doesn’t want anyone physically hurt during his rampage (thus his announcing himself and warning people away from windows before he throws patio furniture through it), he would have been bashing more than just car windows, grills and blowers! Thomas Leopold (Vance Chandler) is better known for his comedic writing, having worked with the likes of Steve Allen and Chevy Chase and penned scripts for shows such as Seinfeld and Cheers. He also has worked as an executive producer. Nicholas Hammond (Ron Werner) would go on to play Spider Man in the 1977-1979 series The Amazing Spider Man. Nick also was one of the youngsters (Friedrich) in The Sound of Music. Don Stark (Carl Dibble) is best recognized now as Bob Pinciotti of That 70’s Show. Also interesting to note he portrayed the character of Bill Maxwell in the 2009 fan film short of The Greatest American Hero. Outrage is listed as his first film credit on the IMDB. Mark Lenard (Mr. Chandler) is best known for his work in the various Star Trekseries’, having played a Romulan, a Vulcan and Klingon. He also is one of the few (if not the only) actor to reprise a character who was not an original lead character across multiple Star Trek franchises. He voiced, though was not seen, as Sarek in the original Star Trek, then reprised the role in two Star Trek films and also appeared on The Next Generation. 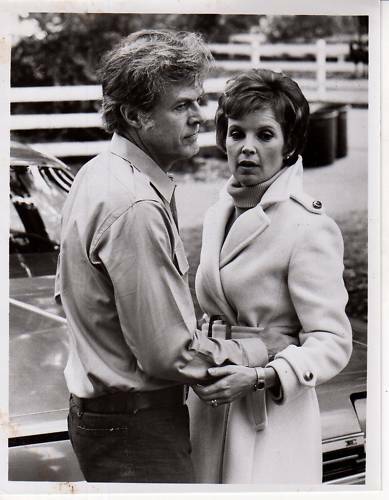 Marlyn Mason (Muriel Kiler) appeared with Robert Culp in the I Spy episode “Weight of the World” and would co-star with him again in another made-for- tv movie The Last of the Good Guys in 1978. Ramon Bieri (Deputy Tottif) is immediately recognizable as he appeared in well over a hundred television shows in the 70s and 80s often as a law man, politician or villain. 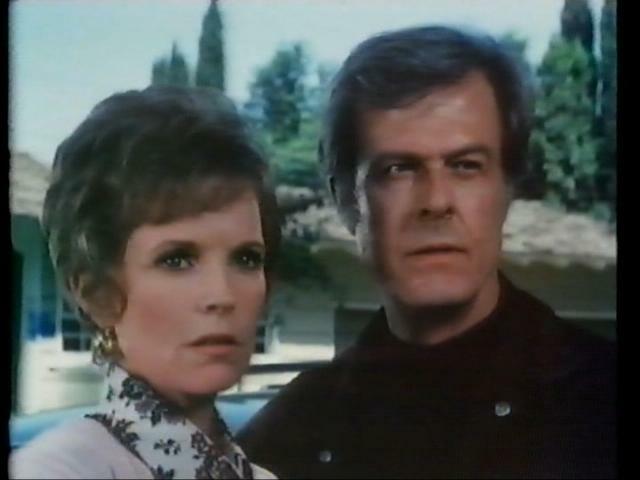 Emmy award winning actress Beah Richards (Thelma) appeared with Robert Culp in the I Spy episode “Cops and Robbers” as Scotty’s mother. She was nominated for an Oscar in 1968 for her role as Mrs. Prentice in the film Guess Who’s Coming to Dinner. A search through the Google Archive turned up a couple of television programming notes around the time the movie originally aired. 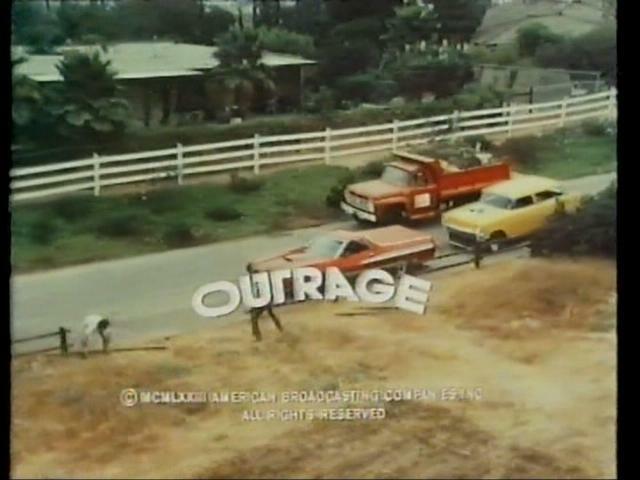 Outrage is available on DVD through modcinema.com. Did we ever find out who the family was that this film is based on? I just watched this tonight on Youtube. Love the old 70’s movies. The ending was rather abrupt though, no confrontation with the families, no investigation, just some text on the screen.